Spring has Sprung and so Have the Bears. As the weather changes from winter to spring, wildlife becomes more active. Bears have come into the valley and are searching for food after months of hibernation. The City, BC Conservation Officers, and Revelstoke Bear Aware agree that keeping garbage and fruit from bears continues to be essential. The first black bears have been spotted all across Revelstoke from Columbia Park to Arrow Heights to lower town. Unfortunately the very first reporting included that a bear had gotten into someone’s garbage. “Garbage is the #1 bear attractant in Revelstoke and the cause of every bear death last year. It’s important for not only the bears but the safety of the community to ensure that garbage is secure. No one wants to be bluff charged by a bear while taking their garbage to the curb. It’ll take the community to ensure this doesn’t happen again.” Says Revelstoke Bear Aware Community Coordinator, Maggie Spizzirri. 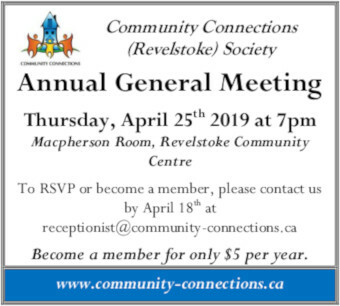 www.revelstokefruitshare.org . If you need help picking your fruit, register your tree at this website and anyone interested in picking your fruit can view and contact you to do so. Or register as a volunteer through Bear Aware’s Gleaning Project and be notified when fruit is available. Revelstoke Bear Aware has partnered with the Community Connections Food Bank and Food Recovery program to ensure that all fruit is used in a positive manner. All inedible fruit will be donated to pig farmers making this a zero-waste project. All portions of the Gleaning Project are free to residents. If you do not have a secure location to store your garbage, such as a shed or closed garage, Revelstoke Bear Aware has launched a cost share program making the purchase of a bear certified resistant storage bin a bit less costly. Revelstoke residents receive $300 off any certified bear resistant storage bin purchased at Revelstoke Home Hardware. install a temporary or permanent electric fence to keep bears away from bee hives, chicken coops, fruit trees or anything else. Call 250-837-8624 for details. Open and available garbage has been spotted throughout the city. If you spot any garbage or other wildlife attractants, the City of Revelstoke has a great reporting app called See Click Fix, http://revelstoke.ca/332/See-Click-Fix . A City Bylaw Officer will speak to the home owners. The wildlife attractant and garbage bylaw requires all residents to secure their garbage. Ideally this would be indoors or inside a garage or shed. For those without a secure place to store garbage. Keep an eye on the Revelstoke Bear Aware Facebook page at www.facebook.com/revelstokebearaware for upcoming events, news about bear sightings, helpful information, and suggestions for keeping your garbage secured from bears. 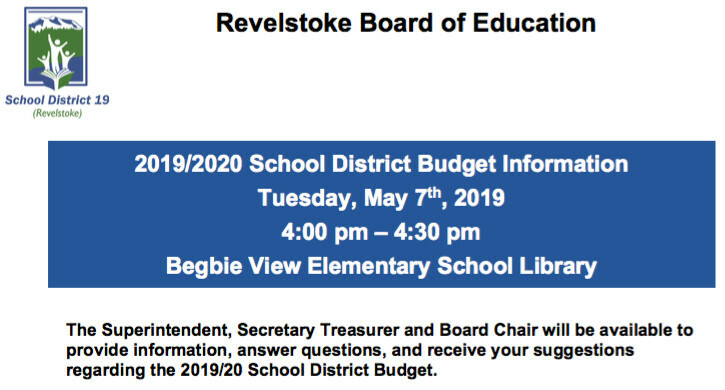 Please visit www.revelstokebearaware.org for more information on managing bear attractants or contact Revelstoke Bear Aware at 250-837-8624. To report bear sightings or conflicts with bears please call the BC Conservation Service 24-hour hotline at 1-877-952-7277. To report a bear attractant to the City Bylaw Officers, contact 250-837-2911 during office hours or email to bylawenforcement@revelstoke.ca . garbage out before 6 a.m. on the day of collection. Harvest ripe fruit and pick up windfall fruit every day. and bring in each night. Feed pets indoors. Store pet food and livestock feed indoors. chickens and beehives), fruit trees, and compost piles. Consider removing outdoor freezers and fridges or be sure they are locked shut. Do not put cooked food, meat, fish or cheese in compost. Keep compost piles working properly. Clean barbecues after each use. Thank you to our sponsors who make the Revelstoke Bear Aware project possible: Columbia Basin Trust, LUSH Cosmetics, Bresco Industries, Revelstoke Community Foundation, Revelstoke Credit Union, Loki Tree Services, Signs Ink and our wonderful members and volunteers. 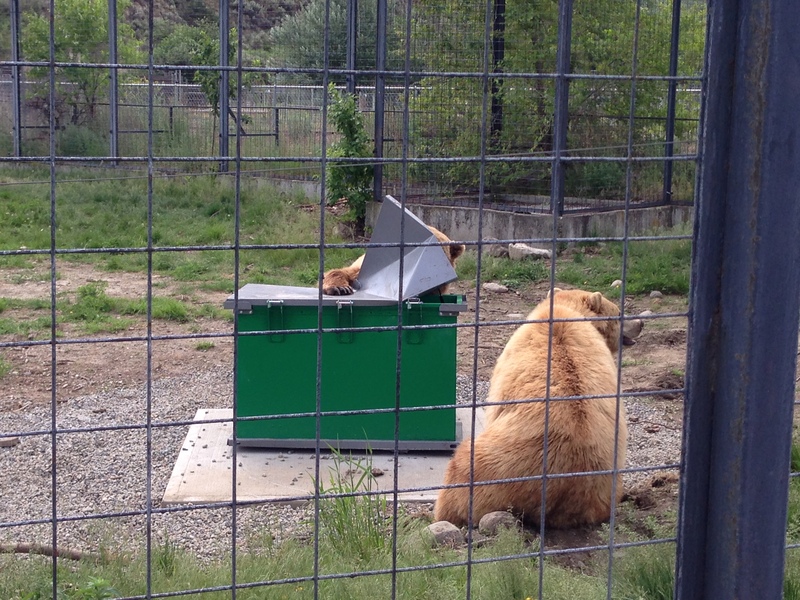 Photo: A bear breaking into a bin during a bear bin testing day in Kamloops.